To prepare tofu, preheat oven to 375°F. Slice tofu into 1/4-inch thick slices and lay flat on a kitchen towel. Fold towel over top of the tofu slices and press down slightly to remove excess moisture. Arrange tofu on a baking sheet that has been lightly oiled with avocado oil. In a small bowl, combine soy sauce and sesame oil. Brush each tofu slice with the soy sauce and sesame oil mixture on both sides. Allow to marinate for 10 minutes. Bake for 30 minutes until golden brown, turning once. To get a crusty finish, broil the tofu on high for 2 minutes per side after baking. Remove from oven and let rest on cutting board for 5 minutes. Cut each slice into cubes and set aside to add to stir-fry recipe later. Boil noodles for 6 minutes. Add sugar snap peas and continue to cook for another 2 minutes. Drain and rinse with cold water. Meanwhile, combine oil, soy sauce, cashew butter, lime juice, chili garlic sauce, and minced garlic. 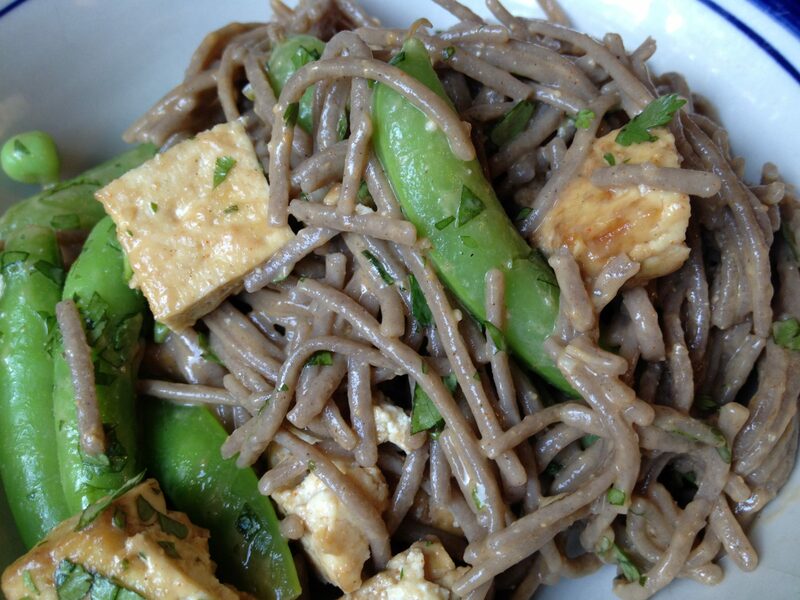 When noodles are done, return to pot and stir in the cashew sauce and baked tofu. Sprinkle with chopped cilantro and serve. Enjoy!